On Sunday we decided to pop into Birmingham City Centre to have a browse and grab some lunch. The original plan was to find somewhere to watch the last football matches of the season (bf asked nicely! ), however as Aston Villa were playing at home, all such pubs were full of football fans, so we carried on up Bennetts Hill, when I spotted the Cosy Club. I had been invited to the launch of this new bar/restaurant, but unfortunately I couldn’t make it, so I took this opportunity to see what it was all about. ‘Quirky, eccentric and playful the Cosy Club offers informal casual dining, drinking and lounging in a homely and family friendly environment. Wow, were the first words that came to mind when we walked in! It was such a grand building, being Grade II-listed and a former Midland Bank, the high ceilings were immense, I just couldn’t stop staring up! We were greeted with a lovely warm welcome and taken upstairs to our table. From the upstairs I had a lovely view of behind the bar and the downstairs area and took this opportunity to take some pictures (sorry about the quality, they were taken on my iPhone as I wasn’t prepared!). Next up my attention was pulled to the menu, and what a menu. There was so much choice, and I don’t mean a big, long menu, just in the variety of what was on offer. There was a brunch menu which featured a full english, steak and eggs and buttermilk pancakes. Alongside this there were sandwiches, burgers, tapas and a good selection of mains, including Thai Beef Noodle Salad, Pan Fried Hake and Yellowfin Tuna Nicoise. 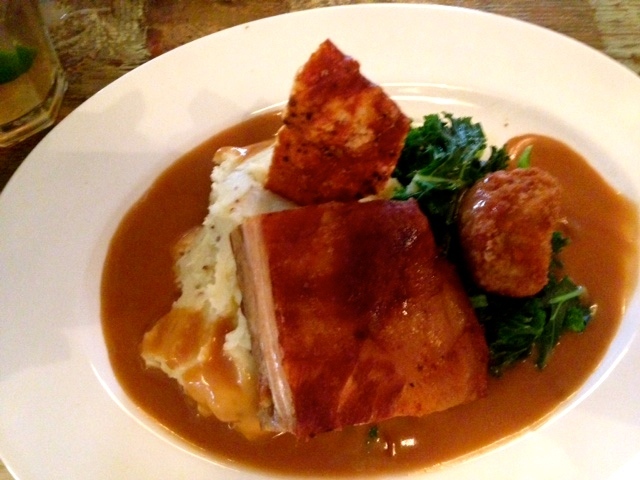 I opted for the Slow-roasted Cherry Orchard Free-Range Pork Belly served with a mint, pea and ham hock fritter, wholegrain mustard mash, curly kale and apple gravy. This came out looking all magnificent, and boy was it just that! It was steaming hot, which I always like from a restaurant, none of this luke-warm business. The pork belly was so tender and fall apart tasty, with the mash having so much flavour, something I am never able to achieve with my own mash! The bf went for a starter of Mushroom Bruschetta, followed by the Pan-roasted Chicken Breast with peas, smoked bacon, baby onions, new potatoes in a creamy dijon mustard sauce. 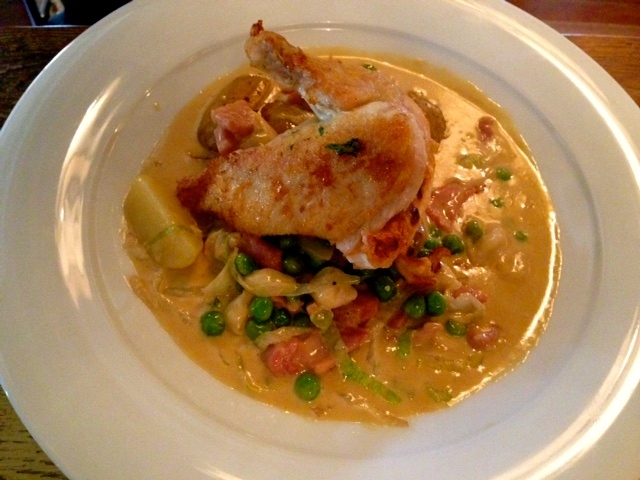 The sauce was so flavoursome, the chicken was really succulent and the ham was nice and chunky. 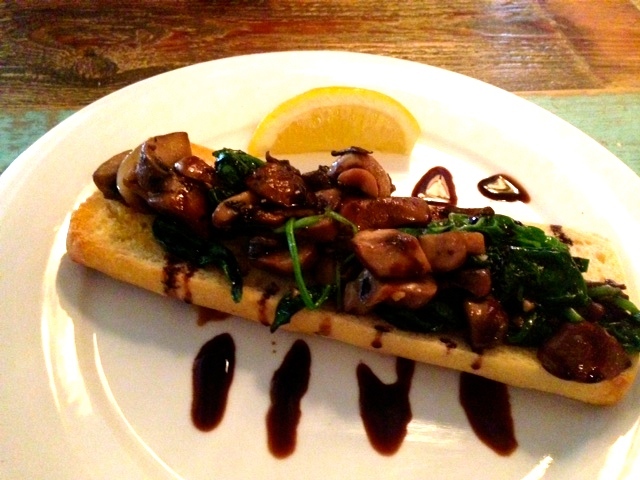 He didn’t think the mushroom bruschetta was anything special, but it was nice enough. We were both quite full by the end of it, but I already had my eye on one of their desserts, the Peanut Butter Cheesecake, although I could’ve easily be tempted by the other offerings of Sticky Toffee Pudding and Apple and Rhubarb Crumble. 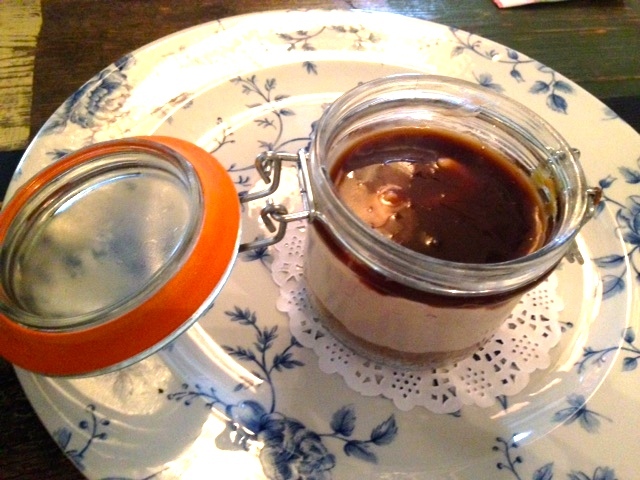 I am so glad I went for the cheescake though, it was heavenly! Not as hard as a normal cheesecake, but soft and creamy and divine! Even the drinks were amazing. Due to me having to drive I wasn’t able to sample any of their delicious sounding cocktails, so I went for something different, trying out the Orchard Pig juices in Totally Minted, which tastes exactly like a mojito, minus the alcohol, which contains Pink Grapefruit, Mint and Lime and the other one I tried was the Very Berried, which was strawberry, blackberry and poppy and was really refreshing. Overall, we were both really impressed with the venue, the service, the food and the price and will definitely be going back again. Have you checked out a Cosy Club, there are 9 – to see if there is one near you check out their website. I will definitely be going back! Especially to try those cocktails out!